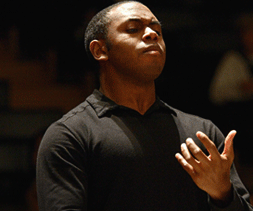 After serving as James Levine’s handpicked assistant conductor at the Metropolitan Opera, young American conductor Kazem Abdullah has since become Generalmusikdirektor of the City of Aachen, Germany, and has guest-conducted major symphony orchestras across Europe and the Americas. He will team up with the astounding young Israeli pianist Alon Goldstein, who debuted at age 18 with Zubin Mehta and the Israel Philharmonic, to perform one of pillars of the piano repertoire, Brahms 1st. Manuel de Falla’s “Ritual Fire Dance” is, in a word, hot, and together with Mozart’s final symphony, concert-goers will dance into the late afternoon of early summer, where Fathers’ Day celebrants will enjoy a post-concert barbeque!